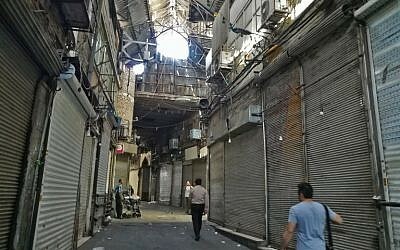 VIENNA, Austria — Three European nations along with Russia and China met with Iran Friday to offer it economic benefits that would lessen the blow of sweeping US sanctions, but the meeting was quickly overshadowed by Iran expressing disappointment and Germany saying it could not offer full compensation for new sanctions. Their foreign ministers were holding talks in Vienna, where the accord was signed in 2015 with the aim of stopping Iran from building the atomic bomb in return for sanctions relief that promised greater trade and investment for the country. 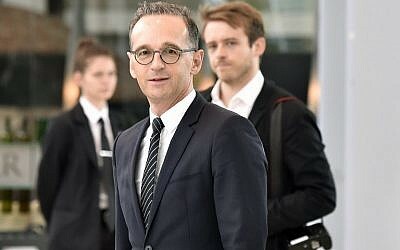 “We are meeting here today to make sure the nuclear agreement with Iran has a future,” German Foreign Minister Heiko Maas said as he arrived for talks with counterparts from Iran and the other signatories Britain, China, France and Russia. In Iran, though, President Hassan Rouhani told German Chancellor over the phone that he was “disappointed” with the deal, according to Iranian state run media. “Unfortunately, there was no clear method or operational solution for the continuation of cooperation, and the package only contained a series of general commitments like in the EU’s previous statements,” Rouhani told Merkel, according to the Tasnim news agency. Rouhani told French President Emmanuel Macron on Thursday that the European economic measures on the table did not go far enough. Rouhani, who visited Switzerland and Austria this week to rally support for the nuclear deal’s survival, said in a phone call with Macron that the package “does not meet all our demands,” Iran’s state news agency IRNA reported. Speaking on French radio before the meeting, Foreign Minister Jean-Yves Le Drian said Iran was making it more difficult to salvage the accord. Since Trump’s shock move in May, which dismayed all other signatories, Washington has warned other countries to end trade and investment in Iran and stop buying its oil from early November or face punitive measures. The other partners so far appear powerless to stop their countries’ companies pulling out of Iran for fear of US penalties. Several major firms — including France’s Total and Peugeot, and Russia’s Lukoil — have said they are preparing to leave. Iran is also worried about continuing its oil exports to other markets and about being shut out of international bank payments systems. “We advise businesses that want to keep investing (in Iran), we want to keep payment systems open, and we want to build security through widening the mandate of the European Investment Bank,” he said. Russian Foreign Minister Sergey Lavrov said both Moscow and Beijing were committed to keeping the nuclear deal going. “Just like our Chinese counterparts, we are interested in preserving and fully implementing the JCPOA. The situation is complex, but, just like China and other parties to the deal, we are committed to international law and the UN Security Council’s decision this plan was enshrined in thus becoming part of international law,” he said according to the TASS state news agency. Iranians have complained that the hoped-for rise in foreign investment and trade after the deal has not materialized. Since Trump’s announcement, Iran’s rial currency has fallen, prices have risen and the country has been hit by street protests and strikes. Rouhani, who signed the nuclear deal, has been attacked at home by ultra-conservatives, who have denounced his willingness to talk to the West and accused him of hurting the economy. Trump in May slammed the nuclear accord signed under his predecessor Barack Obama as “horrible” and “defective at its core,” earning applause from Iran’s regional rivals Saudi Arabia and Israel. Iran, which strongly denies ever seeking to build a nuclear bomb, has warned it could resume uranium enrichment for civilian purposes if the deal collapses. US-Iran relations have been hostile since the 1979 overthrow of the US-backed shah and the US embassy hostage crisis. Washington considers Iran a state sponsor of terrorism, with links to Lebanon’s Hezbollah, Hamas in the Palestinian territories and networks in Iraq and Yemen, and demands it stop supporting Syrian President Bashar Assad. The new round of diplomacy has been clouded after security services said they had foiled an alleged plot to bomb a Paris rally by an exiled Iranian opposition group, the People’s Mujahedeen of Iran. The large rally last Saturday attracted several US politicians, including former New York mayor Rudy Giuliani, now Trump’s personal lawyer. 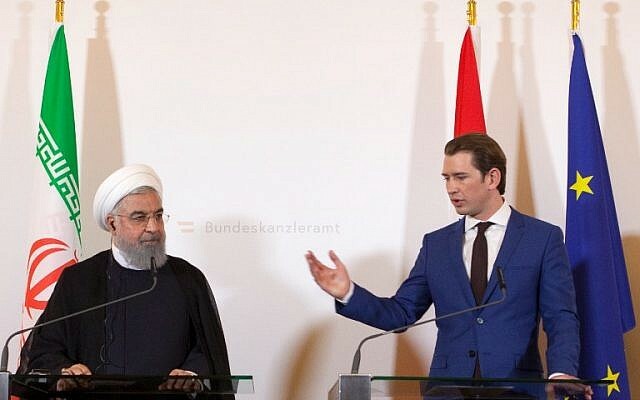 Six people were arrested — a diplomat attached to the Iranian embassy in Austria — in Belgium, France and Germany, while the opposition group blamed the Iranian regime for the alleged plot. Tehran dismissed it is an orchestrated “false flag ploy,” designed to discredit Iran and overshadow Rouhani’s trip to Europe.